I have not released any electronic version myself, but there’s nothing to stop someone — living where copyright is not enforced — scanning a book and selling the digital version for profit. In this case it’s a free download, which is rather insulting, but money can also be made from advertising on the pages that offer free downloads. However I would expect such people to start at the top of Amazon’s fastest-selling books list and work down, rather than starting at the bottom, as in this case. That arouses suspicion. The URL goes to virginvirttualgroup.co.uk, but the link in fact takes you to booksco.co. That’s the first warning sign: I was out of there immediately. A scan down the results of a google search on “Booksco” (without clicking any links) reveals that it is a bookseller with bad grammar. That’s another warning sign. Scamadvisor says that booksco.co is a very new site located in the United States, not in the UK, and adds “but the real location is being hidden.” The owner is in Panama. Its trust score is 29%, less than a US President on a bad day. So as far as I am concerned, it’s case closed: this is fake Church and State. It may take your money or your bank details or provide you with free malware, but it won’t deliver you my dissertation. It is very likely that there is a real bookstore called Books Company, based in Oconamowoc, which is a real town. But don’t use this site or any information on it to contact the real bookshop. 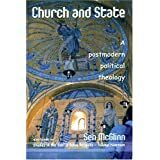 Church and State is still for sale on Amazon, with two used copies in good condition available for $US 28. It is selling out, at the rate of one per year, so get yours this century, or wait for an authentic electronic version, to be advertised by the author. This entry was posted on August 12, 2017 at 12:17	and is filed under Church and State, Uncategorized. Tagged: Church and State, Internet scam, McGlinn, political theology, postmodern theology. You can follow any responses to this entry through the RSS 2.0 feed. You can leave a response, or trackback from your own site.